This is a super-easy vegetarian crock pot recipe - just put all the ingredients for this easy lentil and vegetable soup in your slow cooker in the morning and forget about it until the end of the day. Lentil soup is hearty enough for a main dish, but you could always add extra vegetables to make it even more filling. Lentils are inexpensive, quicker to cook than dried beans, and full of healthy fiber and protein, which makes them great for anyone on a budget, vegetarians, vegans, and anyone looking for a filling, low-calorie meal. All of the ingredients in this recipe are vegetarian and vegan, and, if you need this crockpot recipe to be gluten-free as well, just use a gluten-free or homemade vegetable broth so you know what's in it. 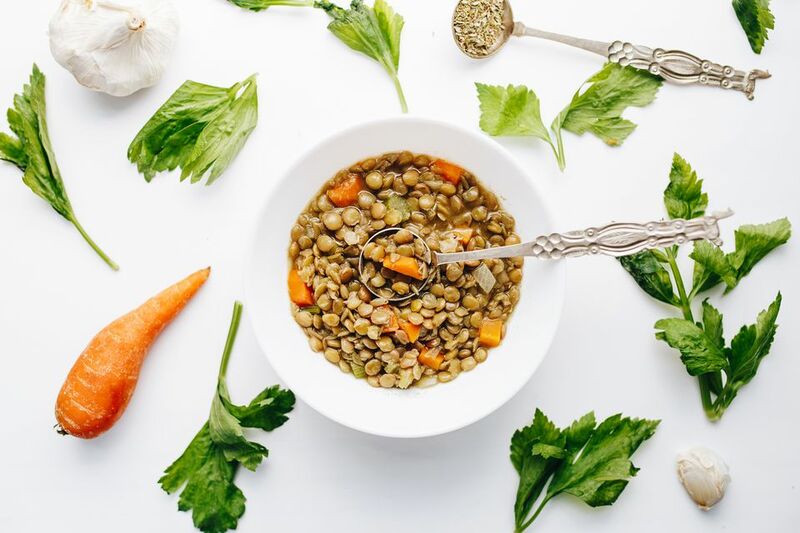 This lentil soup is compatible with the slow carb diet. Pre-soak the lentils in water for at least 2 hours, preferably overnight. Drain, discarding soak water. Stir together lentils with all ingredients in a crock pot. Cook on medium heat in the crockpot for 8 to 10 hours. Enjoy your crockpot lentil soup! Most slow-cooker recipes are referring to the traditional Crock Pot style cooker, which has low, medium and high settings. They're fairly low-tech but easy to use. If you have an Instant Pot, which is a slow cooker that doubles as a pressure cooker, you have a few extra options for cooking this soup and other recipes. You'll have to adjust the settings and use the proper lid, and most pressure-cooker recipes require more liquid to produce the necessary steam. But you can speed up your cooking time if you use an Instant Pot. Check out these tips for converting slow cooker or Crock Pot recipes to Instant Pot versions.